There is a wide range of different types of gift wrap available ensuring that you can wrap everything from large birthday and holiday gifts through to small tokens of friendship. While it is a nice idea to present gifts attractively, when you stop to think, however, commercially produced gift wrap is a significant waste of energy. When you consider the energy that is required to prepare the paper (even if the gift wrap is made using recycled paper, there is still an energy implication), the inks and packaging used plus the energy consumed in transporting the gift wrap from its place of manufacture through to the place of sale and factor into this the minuscule lifespan of the average piece of gift wrap, it is difficult to draw any conclusion other than it's a waste of energy. Luckily, there are some alternatives to traditional gift wrapping, and your packages can still look attractive. There are many eco friendly gift wrapping ideas. 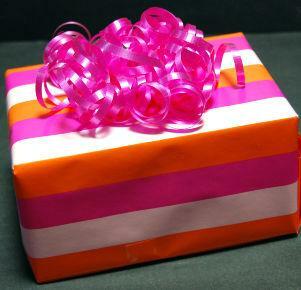 One of the easiest ways to find eco friendly gift wrap is to recycle gift wrap from other gifts. The key to successfully recycling gift wrap is to carefully remove the wrapping paper. While it might be a challenge to stop youngsters from gleefully tearing the paper from their gifts, older people can carefully remove the paper so it can be used again. Some paper can be ironed flat, using a low setting on the iron. A sheet of newspaper or a page from a magazine can make for an interesting alternative to commercial gift wrap. The key here is to make the gift look well presented. If the newspaper is shoddily wrapped around the gift then the gift is going to look like an afterthought. However if the gift is attractively wrapped then this can make a good alternative form of wrapping. It is easy to customize paper and make your own wrapping paper. Newspaper, for instance can be decorated to give it a theme. Rubber stamps are an ideal way to decorate paper. If you don't have any rubber stamps then making stamps from potatoes is a great way to print paper with a range of different designs. Hand prints are also fun and make great patterns on paper. This can be a good project for children as they enjoy the process of making hand prints on paper using paint. An eco friendly alternative to wrapping paper is to use gift bags. Almost any bag can be turned into a gift bag. A simple paper grocery bag, for instance, can be embellished and decorated to create an interesting alternative to a shop bought gift bag. One of the attractive things about gift bags is that they are easy to use time and time again. One key to using alternative forms of gift wrapping is to ensure that the wrapped gifts look attractive. Adding some well chosen embellishments will help to give a finished look to the gift wrap. This can include pretty gift tags or ribbons. A wide range of recycled products can be used to decorate gift wrap. A gift wrapped in newspaper could look stunning when a few buttons from old clothes are added. Some sparkle can be added to gift wrap by cutting shapes from pieces of discarded foil, for instance chocolate wrappers. A decorative paper punch is ideal for this purpose. Finding eco friendly gift wrapping ideas often involves shaking off our preconception of how a gift should look. Once you are comfortable with the fact that a child's birthday present doesn't need to be covered with wrapping paper that features the latest cartoon characters or that a wedding present is no less appreciated if it is not wrapped in traditional wrapping paper, you can start to become more creative in your approach. With a little creative thought it is surprising what can be used.